New traders’ understanding of Forex charts can be key to early success, as they provide a quick picture of the foreign exchange rates that exist between two currencies. The charts and graphs behind Forex trading aim to provide a visual cue for trend lines of future trades. They also enable traders to track their own investments. Charting tools and indicators can be a valuable resource for investors to make smart decisions. Symbol: Each foreign currency you would want to track or trade has a three-letter symbol. For instance, “USD” represents the United States dollar. Period: Forex charts are made up of data points, with each point representing a period of time in which the currencies’ exchange rate varied. Each period can be less than an hour, or more than a day, depending on your needs. Data range: This span of time covers your chart’s data points that show activity. For instance, if your Forex chart has 30 (or 31) periods that cover a day each, your data range is a month. The “candlestick” method of showing a currency’s activity in a period of time is most common. The candlestick enables a quick view of the opening and closing prices of a currency for that period, such as a day of trading. And it also shows the high and low points it saw within that span. The body of the candlestick will be green or red. A green candlestick shows a higher price at closing than where it had opened. A red candlestick shows a lower price at closing. A black line extending from the candlestick is referred to as its “wick.” That’s what provides the additional detail of the highest price and/or lowest price at which trades took place between the period’s opening and closing. Moving averages can define a general long-term trend upward or downward in price amid multiple short-term fluctuations. The Relative Strength Index is considered an oscillator indicator. RSI can be used to illustrate profits and losses in relation to whether buying activity has led a currency to be overbought, or selling activity has led it to be undersold. Stochastics is another oscillator. It follows the momentum of a currency’s price with regard to the general tendency that it at some point in time will reverse. Stochastics also can be used to spot overbuying or overselling. And the Bollinger Band is considered a volatility channel. It is used to track a price’s moving average plus an added amount called a standard deviation in order to anticipate trends. Sometimes those trends can be based on support or resistance levels. 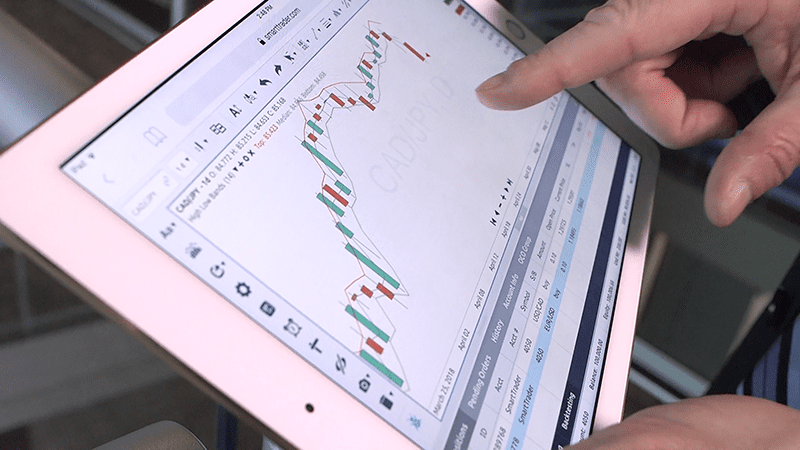 With certain software, you can choose from pre-loaded indicators and create your own customizable charts to reflect the data you find important. Some will allow you to install an indicator that isn’t pre-loaded, to be viewed in your charts. Software tools are designed to provide you with the data that makes you comfortable in your trading research. The SmartTrader platform from Market Traders Institute, for example, connects traders globally with easy-to-use tools that employ Auto-Syncing technology — to allow web-based analysis or trading on any computer, tablet or smartphone. Want to win at Forex trading? Developing an understanding of charts and the indicators they depict will be among your most important first steps.